Review: Tales of the Old Margreve by Open Design. Metric: Matryoshka (Russian nesting dolls). DISCLAIMER: This review is based on a PDF copy with the Margreve Companion and some neat paper miniatures provided by Open Design. Summary: 5 matryoshka (out of five). This screams 'Run Me!!' loudly and often. An entire setting inspired by Slavic, Russian and Teutonic legends through the lenses of del Toro, Tim Burton and the Brothers Grimm. With monsters, magic and adventures on top, it's beautifully crafted and evocative - the art is delightful. If you have a Pathfinder GM, get them this for the holiday season and go into the woods. Content: 5 matryoshka (be sure of a big surprise). 3/4 location, 1/4 magical beast. Add mystery and terror to taste. 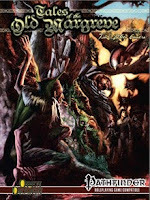 Fans of Thomas Covenant and Ravenloft will intuitively grasp the Old Margreve, others are quickly brought up to speed concerning the hunger and territoriality of the Margreve. Various locations are described, some are magical gotchas for the party with everything, others offer unusual environments for encounters, some of which cater to high-level parties. An army of treants you say? Some of whom are petrified? This could be a bad day. The peoples of the Margreve (forest folk, Kariv gypsies and exiles from Doresh) are given enough detail for characters. There's plenty of details for a GM to include to make this sing. Magic is evocative, with names that go beyond bald description and into mood. Step Like Me needs to be a ranger spell too but other than that, everything is good. The 0th-level incantations are a thing of beauty and offer tangible benefits (and concurrent drawbacks). Publishers of PDFs should look on these and take note, the bar just got raised again. The bestiary is breathtaking. Creatures like the myling (who combines restless ghost children with Sindbad's Old Man of the Sea), the sap demon (an ooze that possesses the unwary) and the suturefly (who sews up the mouths and noses of liars) show top quality. Russian folklore is well represented with the rusalka, leshy and the zmey - a three-headed dragon that lusts after flesh and courts maidens. Every entry has re-usability and drips with flavour. The adventures are wonderful examples of how to twist fairy and ghost stories into adventures. This may not be to everybody's taste but honestly, even the most obvious is excellently crafted. Saying more will spoil the surprises but all of these are exceptional and could with a little foresight provide wonderful flavour to a campaign. Personal favourites include Hollow (atmosphere through the roof), Gall of The Spider Crone (the 'WTF? This is awesome!' moments fly thick and fast) and The Lustful Dragon (a high-level romp through the Margreve). Plus Grandmother's Fire features Baba Yaga, everyone's favourite Russian witch in a tale to return fire to a cursed Margreve. Art/Layout: 5 matryoshka (effective and enchanting). The cover shows denizens of the Margreve watching a band of heroes taking nervous footsteps into the woods. Interior art is used effectively, black & white illustrations give a fairytale quality. The bestiary illustrations are effective in this, the Children of the Briar, deer centaur and vila in particular. Cartography is excellently done and the locations mapped evoke the flavour of the setting. In closing: An exemplar patronage project, this deserves your time, attention and money. A damn fine book in it's own right, it compliments Paizo's Kingmaker adventure path beautifully. In my view a contender for Best RPG product of the year and on par with the first Forgotten Realms or Ravenloft box set. Yes it's that good. Open Design have also provided additonal source material in Kobold Quarterly and compiled these into a Companion that's also worth taking a look at as it compiles all of this in one place and offers some additional thumbnail NPCs on top.